It's an annual tradition here at the worldwide headquarters of Seeking Boston Marathon to provide my runner friends with a Thanksgiving Toast Cheat Sheet. For those that know me well, you know it's my favorite time of the year. With a career that has me on a plane (a lot) as a technology sales executive by day, I do my best to juggle life, family, training, racing and work. I always enjoy the holidays to slow down a bit, eat too much, perhaps drink too much and enjoy. This year, I have a lot to be thankful for starting with my family and the extended part of my family with respect to my I Run 4 Michael Run Buddy Liam. Depending on health and the smoke dissipating in N. California, we will run our first marathon together in December at CIM. With that, the holidays can also bring tension; perhaps it's the drunk uncle that reeks of too much bourbon and "Old Spice" or debates around the table around the merits of raking 100's of thousands of acres of forest (yeah, I went there.) Then there's the inevitable awkward moment when someone starts the "let's go around the table, and share what we're thankful for" drill. Perhaps speaking in front of (even a small) group is not your thing and you struggle with the right words. Quite likely, many around the table don't really understand runners. 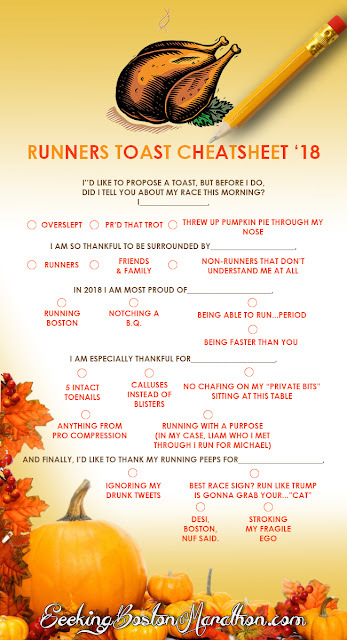 Of course all runners have no shortage of material when talking about running, but here's a cheat sheet to help you through those potentially awkward moments. When Did the Run Community Turn Ugly?